HALIFAX, Dec. 1, 2017 /CNW/ – Clearwater Seafoods welcomes the Anne Risley into its fleet of clam vessels this morning during an official ceremony at Pier 21 in Halifax. This vessel further strengthens Clearwater’s commitment to delivering the highest quality, frozen-at-sea, wild-caught Arctic surf clams to its customers around the world. "The Anne Risley represents a $70 million investment to replace an existing 31 year-old clam vessel with a state-of-the-art factory ship that will deliver significant productivity and efficiency improvements to Clearwater’s clam fleet," said Ian Smith, CEO, Clearwater Seafoods. "This investment follows the launch of the Belle Carnell in July 2015, which now completes Clearwater’s fleet modernization program, creating one of the most modern and technologically advanced fishing fleets in the world." Named after Clearwater co-founder John Risley’s late mother, a Red Cross nurse and devoted mother of four, the Anne Risley will harvest Arctic surf clams year-round off the coasts of Nova Scotia and Newfoundland and Labrador. The vessel measures an impressive 73.4 metres in length and is equipped with most up-to-date systems and multi-beam sonar technology. Clearwater is also pleased to announce the recertification of the offshore Arctic surf clam fishery under the Marine Stewardship Council standard for sustainable wild fisheries, further demonstrating Clearwater’s commitment to responsible seafood. "The Clearwater offshore Arctic surf clam fishery certification confirms this fishery meets the rigorous global environmental standards set out by the MSC," remarked Smith. 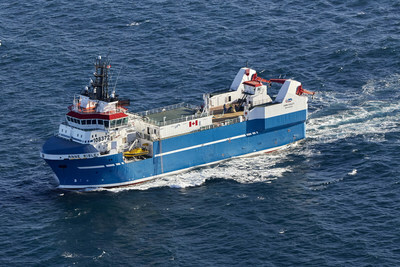 "The Anne Risley is the most technologically advanced shellfish harvester in the world, employing the same advanced proprietary systems as the Belle Carnell," said Tony Jabbour, Vice President Fleet Operations, Clearwater Seafoods. "We’re extremely pleased to be adding this modern, more efficient vessel to our fleet, further strengthening our leadership in innovative, sustainable seafood harvesting." The clams harvested by the Anne Risley and her crew will be automatically shucked and individually-quick-frozen within an hour of catch using the vessel’s proprietary and advanced harvesting and processing technologies. Products will be sold almost exclusively into international, high-value sushi and sashimi markets, greatly expanding both Clearwater and Canada’s seafood exports to the North American, Asian and European markets. "Global demand for seafood is outpacing supply, creating favourable market dynamics for vertically-integrated producers," said Smith. "This investment is another demonstration of Clearwater’s ongoing commitment to create the greatest economic return for the fishery, while ensuring the principles of fisheries conservation science are upheld and respected, with resources safeguarded for future generations," concluded CEO Ian Smith. Wild-caught from the cold, clear waters of the Canadian North Atlantic, Arctic surf clams (mactromeris polynyma) are sustainably harvested from the healthy Canadian fishery by Clearwater-owned and operated vessels. The Arctic surf clam fishery is Marine Stewardship Council (MSC) certified, the world’s gold standard in third-party independent certifications for sustainable fisheries. Arctic surf clams are blanched and individually-quick-frozen (IQF) onboard Clearwater’s vessels within an hour of harvesting. After arriving at Clearwater’s processing facility, clams are sorted, size graded and rigorously quality control tested before being packaged in a variety of formats. Clearwater is the global provider of Arctic surf clams. Clearwater is one of North America’s largest vertically-integrated seafood companies and the largest holder of shellfish licenses and quotas in Canada. It is recognized globally for its superior quality, food safety, diversity of species and reliable worldwide delivery of premium wild, eco-certified seafood, including scallops, lobster, langoustine, clams, whelk, coldwater shrimp and crabs.